As Robert W. Gutman observed, “cannonades preluded the birth of Richard Wagner“. * When he passed up, from Venice to Valhalla, almost seventy years later, he had been working on “The Feminine Element in Humanity”, a concept bearing some similarity to work of another German giant, Goethe, and he expired in the arms of his wife, Cosima. Betwixt 4 am on 22 May, 1813, and 3.30 pm on 13 February, 1883, the greatest music dramatist that ever lived led a hectic, crowded life, one that defies encapsulation, even by the very best biographers. You’d need to spare a couple of decades, travel a million kilometres, learn German, French and Italian, read the Icelandic Sagas and the great works of Christian myth, immerse yourself in 17th century European history (including the malady of anti-semitism), learn to read music, delve into enlightenment literature (including philosophy), and harass a myriad librarians, in order to write a biography that does him justice. We lack the time and tools for that; instead, as a service for Wagnerians and fans of linear time, we offer this Wagnerian Timeline, as an ongoing construction. 22 May – Wagner born in Leipzig, Saxony. 16 August – Wagner baptized in Teplitz. 23 Novemer – Wagner’s legal father, Carl Friedrich, dies. January – An elder sister, Maria Theresa, dies, aged 4. February – Ludwig Geyer engaged to Johanna, Wagner’s mother. 28 August – Mrs Wagner marries Ludwig Geyer. Brief attendance at Karl Friedrich Schmidt school. 18 June – Weber’s Der Freischütz premieres at Berlin. 30 September – Death of Geyer. Wagner sees Der Freischütz at Dresden. 2 December – Wagner enrolled at Dresden Kreuz School, and takes intense piano lessons. His sister, Klara, debuts at Dresden Opera. Wagner displays his aptitude for Greek, translating 3 books of the Odyssey. He starts, and abandons, an epic poem. 28 January – He starts at St Nicholas School at Leipzig. 26 March – Beethoven dies. Mid-year – School trip to Leipzig. 8 April – He is confirmed in Dresden, under the name ‘Geyer’. 21 January – Returned to Leipzig, takes composition and then harmonic lessons. Wagner sees Fidelio in Leipzig. He hears Wilhelmine Schröder-Devrient sing. 25 December – His B-Flat Major (Drum-beat) Overture is played at Leipzig, conducted by Heinrich Dorn. Mid-year – Composes Piano Sonata and a Fantasia. Mid-year – C Major Symphony. Begins, then abandons, an Opera, Die Hochzeit. He writes libretto for Die Feen. Wagner composes Die Feen (first performed at Munich in 1888). May – Wagner goes to stay with brother Albert at Würzburg, become Chorus Master. 8 January – Wagner completes Die Feen. 21 January – He returns to Leipzig. June – Wagner prepares libretto for Das Liebesverbot. He is appointed musical theatre director in Lauchstädt; meets Minna Planer. 2 August – Conducts Don Giovanni. January – He begins to compose music for Das Liebesverbot. Mid-year – Visits Bayreuth; visits Nuremberg and sees a street fight. August – Starts notes for autobiography. 29 March – Das Liebesverbot premieres (catastrophically) in Magdeburg. 24 November – Wagner marries Minna. Wagner is music director of Königsberg Theatre. March – Composes the Rule Britannia Overture. May – Minni runs away, but she and Wagner reconcile later in the year. June – Wagner appointed musical director at Riga theatre. July – He starts prose-sketch work on Rienzi. 1 September – First conducting at Riga. November – His sister Rosalie passes away. 24 December – Cosima Liszt born at Como. Begins compositional work on Rienzi. November – He conducts concert series of works by Beethoven, Weber, Mendelssohn & Wagner. Wagner and Minna flee Riga, and creditors, take a stormy voyage to London (arrives 12 August). 20 August – France: He meets Meyerbeer. 17 September – Arrives in Paris. 24 November – Berlioz’s Roméo et Juliette. December – He composes draft of his Faust Overture. January – Faust Overture completed. June – Wagner sends Meyerbeer an early draft of The Flying Dutchman. 19 November – Completes score for Rienzi. November – He is close to being jailed for debts. November – Wagner completes The Flying Dutchman. Wagner starts work on Tannhäuser. 7 April – Wagners leave Paris for Dresden. 20 October – Rienzi first performed, at Dresden, with success. 2 January – Premiere of Der Fliegende Holländer in Dresden. 2 February – Wagner becomes kapellmeister to the King of Saxony. February – Publishes Autobiographical sketch. 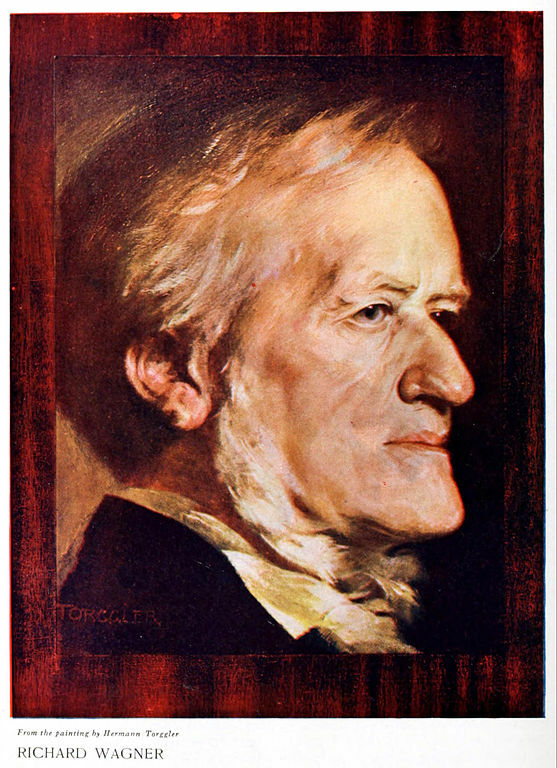 Wagner reads ‘German Mythology’ by Jacob Grimm and begins composing Tannhäuser. April – Completes poem of Tannhäuser. He starts collecting works on German mythology and medieval matters. 7 January – Wagner commences conducting of The Flying Dutchman in Berlin. He writes a musical homage to the King of Saxony. 15 October – Birth of Nietzsche. 15 December – Wagner has Weber’s remains come to Dresden; he composes and conducts the funeral march for Weber’s funeral. 3 July – Wagners take the last waters at Marienbad. July – Wagner commences work on Die Meistersinger and Lohengrin. 3 August – Completion of libretto for Lohengrin. 25 August – Birth of Ludwig II. 19 October – Premiere of Tannhäuser in Dresden. 2 March – Wagner’s memo re orchestral re-organisation. 5 April – Wagner conducts the Choral Symphony and Beethoven’s 9th on Palm Sunday. 30 July – Completes first draft of Lohengrin. He meets Hans von Bülow. February – He conducts Gluck’s Iphigénie en Aulis. 29 August – Wagner works at and completes libretto for Lohengrin. 24 October – Conducts Rienzi in Berlin. 9 January – His mother dies. Wagner sends poem of support to Viennese uprising. 28 April – Wagner completes score of Lohengrin. He will not write music again till 1853. May – Wagner submits his “Plan for the Organization of a German National Theatre for the Kingdom of Saxony”. May/ June – He begins revolutionary activities. July – Travels to Vienna, meets Herr Hanslick. c. October – He begins to think on and write what will become the Ring. 2 May – Dresden revolt. 9 May – Wagner escapes from Dresden. 13 May – He goes to Weimar. 16 May – Warrant issued for Wagner’s arrest. 28 May – He arrives in Zurich. January / May – He works in Zurich, then Paris, and travels to Bordeaux, has an affair with Jessie Laussot. 3 July – He returns to Minna in Zurich. 28 August – Liszt conducts Lohengrin in Weimar ‘timed’ by Wagner. October – Bülow becomes Wagner’s pupil. He conceives the basic shape of the Ring and its presentation. 15 September – Hydrotherapy in Switzerland. October – A loan from Julie Ritter. Wagner proceeds with text of the Ring. February – Wagner meets Mathilde Wesendonck. April / May – Conducts revised Holländer in Zurich. July / December – Verse drafts of Rheingold, Walküre, Young Siegfried. February – Wagner reads text of the Ring to a private audience in Zurich. May / June – Piano sonata from Mathilde Wesendonck. July – Wagner takes the cure in St Moritz, visit from Liszt. August / September – A trip to Italy. September – Conceives Prelude to Das Rheingold in a dream during stay at La Spezia. 10 October – He meets Cosima in Paris. November – Wagner composes music for Das Rheingold. He is enamoured of Mathilde Wesendonck. June – Minna in bad health, takes a cure at Lake Lucerne. June / July – Wagner composes music for Die Walküre. September – Otto Wesendonck settles a portion of Wagner’s debts and agrees to pay an allowance. December – Conceives Tristan und Isolde. January – He revises Faust Overture. March / June – Wagner in London, conducting 8 concerts without gain. Mid-year – He meets Victoria and Albert; he meets Berlioz. He works on Tristan und Isolde in Zurich and thinks about Parsifal. Autumn – Attacks of erysipelas. 23 March – Wagner completes score of Die Walküre. Summer – Takes the water cure. September onward – He works on Gotterdammerung, Siegfried and Tristan. 19 December – First finished musical sketches for Tristan. 10 April – Wagner finishes prose sketch of Parsifal. April – The Wagners move to the Asyl, a house lent by the Wesendoncks. 9 August – Wagner ceases work on the Ring (Act II of Siegfried); he takes it up 8 years later. 29 August – Hans and Cosima von Bülow visit the Wagners. October – He starts compositional work for Tristan and sets 5 poems by Mathilde Wesendonck to music. January – Wagner sees Berlioz in Paris, discusses Les Troyens..
7 April – Minna intercepts ‘confessional’ letter from Wagner to Mathilde Wesendonck. 17 August – Wagner leaves for Venice. 29 August – Arrives in Venice, resumes work on Tristan. 24 March – Under political pressure, Wagner leaves Venice for Lucerne. 6 August – He completes Tristan und Isolde. September – He concludes sale of copyright for The Ring score; leaves for Paris, followed by Minna. 17 November – Wagners reunite in Paris. January / February – Conducts three concerts of his music. 22 July – Wagner receives a partial amnesty, allowing him to return to German kingdoms (except Saxony). 21 September – Schopenhauer dies. 24 September – He begins rehearsing Tannhäuser in Paris. 13 March – Tannhäuser crashes and burns in Paris. May – Wagner sees Lohengrin performed in Vienna. November – On train trip from Venice (where he visits the Wesendoncks) to Vienna, he begins to formulate Meistersinger. Wagner, separated from Minna, moves to Biebrich. 5 February – He holds a public reading of Meistersinger in Vienna. 28 March – Full amnesty granted. July – Bülow and Cosima visit. Wagner coaches the Schnorrs on Tristan and Isolde. September – He conducts Lohengrin in Frankfurt. .November – Wagners’ last meeting in Dresden. 23 November – Private reading of Meistersinger. January / April – Wagner undertakes a large concert programme throughout Europe. May – Furnishes his bachelor pad in Vienna luxuriously. July / December – Concert programme continues. November – Meets the Bülows in Berlin; Wagner and Cosima decide they are soul-mates. 10 March – King Ludwig II ascends the Bavarian throne. Wagner skips Vienna and hides from his creditors. 4 May – Ludwig’s invitation arrives. June – Cosima arrives in Bavaria. August – He produces Homage March for Ludwig; Liszt visits. October – He takes up comfortable lodgings in Munich courtesy of the King. November – Ludwig decides to build Wagner a festival theatre. He resumes helping Siegfried up the mountain. 10 April – Isolde born to Cosima and Richard. 10 June – Premiere of Tristan und Isolde in Munich under Bülow. 17 July – He commences dictating Mein Leben. 21 July – Death of Schnorr. August – Prose sketch for Parsifal. 6 December – King Ludwig asks Wagner to get out of town for the time being. 10 December – Wagner skips Munich – heads to Geneva. 25 January – Minna dies, in Dresden. March – Cosima joins Wagner in Tribschen, near Lucerne. 22 May – Ludwig drops in. June – Wagner – Cosima scandal breaks. 17 February – Wagner’s and Cosima’s daughter, Eva, born. April – Bülow appointed Kapellmeister to Ludwig. 24 October – Wagner completes Meistersinger. 23 December – He returns to Munich. 21 June – Successful premiere of Die Meistersinger von Nürnberg in Munich. 8 November – Wagner and Nietzsche meet in Leipzig. 16 November – Cosima formally joins Wagner at Tribschen. 1 March – Wagner resumes work on the Ring, finishing Act II of Siegfried. May – Nietzsche comes to Tribschen, the first of 23 visits. 6 June – Siegfried Wagner born. 22 September – Das Rheingold premieres in Munich, over Wagner’s opposition. 2 October – Wagner commences work on Gotterdammerung. December – He reads Parsifal to Cosima and Nietzsche. 26 June – Die Walküre premieres in Munich. 26 June – Cosima and Hans’ marriage dissolved. 18 July – Official divorce of Cosima and Hans. 19 July – Franco-Russian War starts. 25 August – Wagner and Cosima marry in Lucerne. 7 September – Writes essay on Beethoven. 25 December – Siegfried Idyll. 5 February – He completes Siegfried. 16 April – The Wagners visit Bayreuth. 12 May – Wagner announces first Bayreuth Festival will be in 1873. November – Bayreuth Council votes to provide Wagner with the site for the Festspielhaus. January – Nietzsche sends Wagner a copy of his important work, The Birth of Tragedy. February – Wagner scouts for singers and conducts fundraising concerts. 22 May – Wagner lays the foundation stone for the Festspielhaus. October – Liszt’s first visit to Bayreuth. 3 May – Begins full score of Gotterdammerung. 22 May – Ludwig Geyer’s Der bethlehemitische Kindermord performed at Bayreuth. 30 August – Announces festival postponed till 1875. November – Wagner asks Ludwig for funding help. February – Ludwig makes a ‘loan’ towards the Festspielhaus. 28 April – Wagners move into Wahnfried. June / September – Ring rehearsals. 21 November – He finishes Gotterdammerung (See 1848). Substantial rehearsals for the Ring. March – American Centennial March. 3 June – Final Ring rehearsals. 13 August – first Bayreuth festival – Das Rheingold. 14 August – first Bayreuth festival – Die Walküre. 16 August – first Bayreuth festival – Siegfried. 17 August – first Bayreuth festival – Gotterdammerung. October/December – Wagner in Sorrento, meets Nietzsche for last time. 19 April – Text of Parsifal completed. May – Wagner on concert tour in London, meets Queen Victoria at Windsor. September – He begins to compose Parsifal. January – First issue of Bayreuther Blätter. February – Wagner caught burning love letters from Judith Gautier. 31 March – Royalty deal with Ludwig. Prelude to Parsifal in Wahnfried. April – He works on, and completes, text of Parsifal. 31 December – The Wagners move to Italy for his health. In Naples. He sees Palazzo Rufolo, the inspiration for Klingsor’s magic garden. 30 October – conducts Parsifal prelude for Ludwig at Munich. 12 November – Last meeting with Ludwig. 17 November – Return to Bayreuth. 25 April – Wagner completes score for Act I of Parsifal. 5 – 9 May – The Ring staged in Berlin (Wagner has heart trouble during performance on 29th). 11 May – He receives Count Gobineau in Bayreuth. 20 October – Act II of Parsifal finished. 5 November – Move to Palermo. 13 January – Wagner completes Parsifal in Sicily. 15 January – Renoir’s god-awful portrait of Wagner. March – Wagner’s first major heart attack. 1 May – He returns to Bayreuth. 26 July – Premiere of Parsifal at Bayreuth. August – Conducts (Parsifal) for the last time. 14 September – Wagners return to Venice, residing at Palazzo Vendramin. 24 December – He conducts C major symphony. 13 February – Death in Venice (Trauermarsch – 18 February).